Fossil fuels, coal, gas, turf and oil will all run out and there will be none left. They are also very bad for the planet causing pollution, global warming and the destruction of the ozone layer. 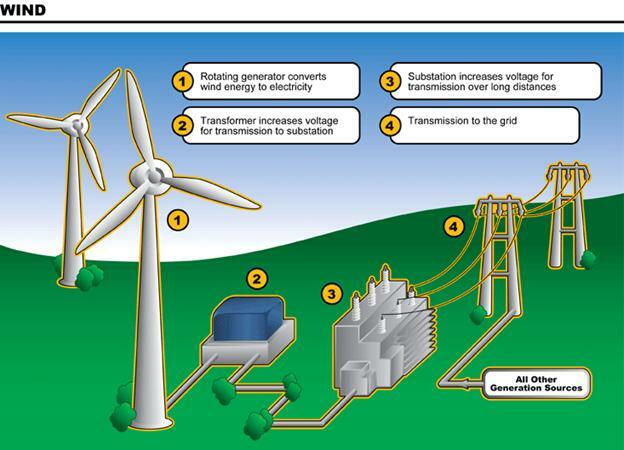 As a result we need to find alternative, environmentally friendly power sources. In class we looked at hydro power, making electricity using power from large rivers and dams. In Ireland we do not have huge rivers. 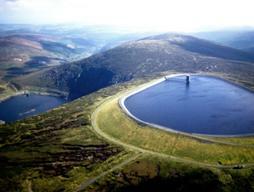 We have a hydro-electric plant at Turlough hill. Perhaps we could build more like this. We looked at solar power and the use of solar panels, which use sunlight on a sunny day , and also photovoltaic panels , which use light from the sun, i.e. daylight. Solar panels are used by quite a few houses now. 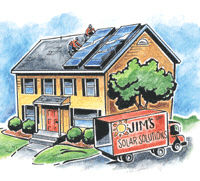 The photovoltaic panels are very expensive because silicon and other materials are used in them. These are a great idea for Ireland as we do not get many sunny days but we get long hours of daylight, especially in the summer. We looked at biomass fuels and as there are many, many empty fields in Ireland we feel that farmers could grow these crops. They would make money, create eco-friendly energy and create jobs. Finally we looked at wind power and went to visit the first park in Ireland that runs everything in the park on power made using the 5 wind turbines in the park. Fr. 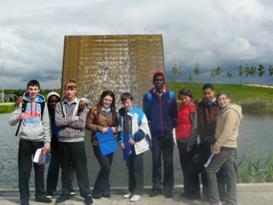 Collins Park in Donaghmede, opened on Wednesday 27th May 2009. It was designed by Argentinean architects, Abelleyro + Romero Architects. 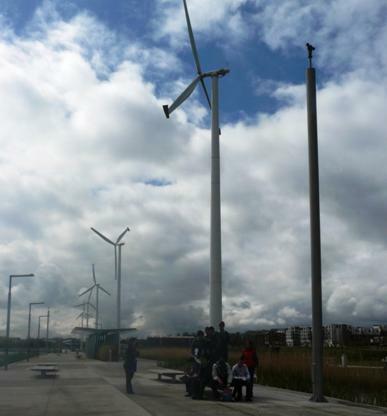 They won the competition to design the park.There are 5 wind turbines. 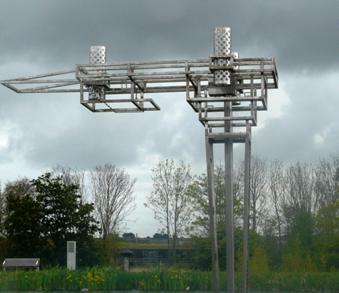 The five wind turbines harness the wind and provide the energy that powers the park’s lighting that heats the water in the changing facilities that works the pumps in the reed beds and operates water features and the fountains. First we walked around the Circuit track. This is 1, 5 km. long and you can run, cycle or walk it. There are 6 health stations along the way. Here you do different exercises to get you fit. Around the edge of the track there are ancient hedgerows. These go back to the 18th.century. They were left as two thirds of the birds in Ireland make their nests in hedgerows. We passed the maintenance depot which is like the control centre for the park. 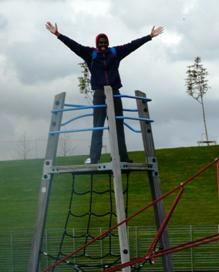 Then we came to the five grass pitches, these are used for Gaelic football, soccer and even baseball. 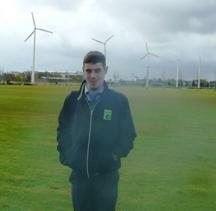 This is Brian standing on the pitch with the 5 wind turbines behind him. Next we went to the changing room. Here all the water and lights are worked by the power from the wind turbines. 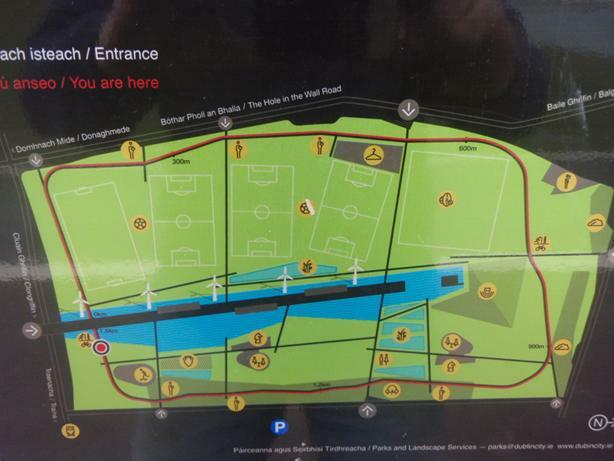 The changing rooms belong to Trinity –Donaghmede Football club. On the outside the building looks like a grass covered hill. On the top of the hill there are glass bricks which let light into the changing rooms below. 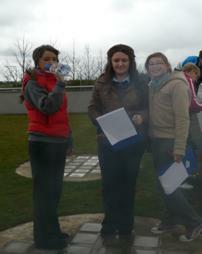 Here are the girls standing on these glass bricks! Next we went up the centre of the park where there are the wetlands, the water features, the turbines and the play areas. The wetlands are areas of water. Reeds and other flora grow there. These plants are natural filters. This means they clean the water. Then pumps in the water pump the clean water to the fountains and water features and changing rooms. The wetlands are also the habitat of water fowl. 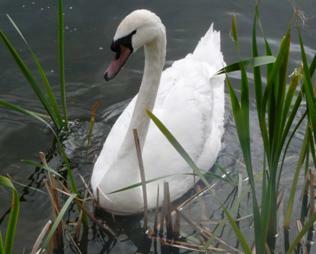 We saw ducks and swans on our trip. The pumps which were just under the water are operated by the wind turbines. 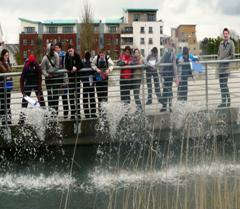 The water features were spouts of water along the central stream and a lovely water wall. In the water there were several sculptures. These were meant to be upside down oil rigs! The idea was that this park is looking after nature not taking from it.Oil rigs took oil from the earth so Father Collins park is giving back to the earth. The wind turbines were huge. Unfortunately there was nearly no wind so only one turbine turned. That was only for a minute!! Each turbine is 32.5 metre high. The diameter of the rotors is 15 meters. 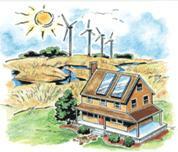 Each creates 50Kwh. of power. This means it makes 50,000 watts. A kettle uses 1800 watts if it was on for an hour! 50KWh would operate a small factory. A house uses 2-3 KWh. They operate when winds are blowing at between 33 and 45 miles per hour. If winds are very strong the brakes come on. Last we went to the playgrounds. There were two and the ground surface was made from recycled runners! It was very bouncy and soft. 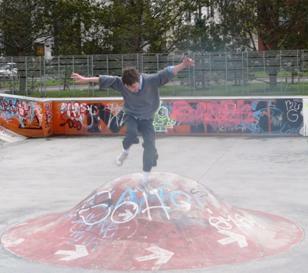 Then there was the skate park made from eco-friendly concrete. This means that when the concrete was being made it created less dangerous carbon dioxide. We had a lovely morning , even if the turbines were not turning and the weather was freezing and miserable. 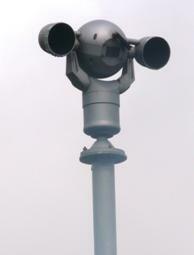 And even the cameras watching us were operated by wind power. Fr. Collins Park features a large lake and central promenade with 3 shelters offering shade and protection from the weather. Picnic sites are available in attractively landscaped areas with grassland areas dedicated for casual pursuits like walking, playing football and ‘frisbee’.etc. The turbines are estimated to save 320 tonnes of CO2 per annum. The turbines have a rotor diameter of 15 metres. The overall height of the turbine to blade tip is 32.5 metres.